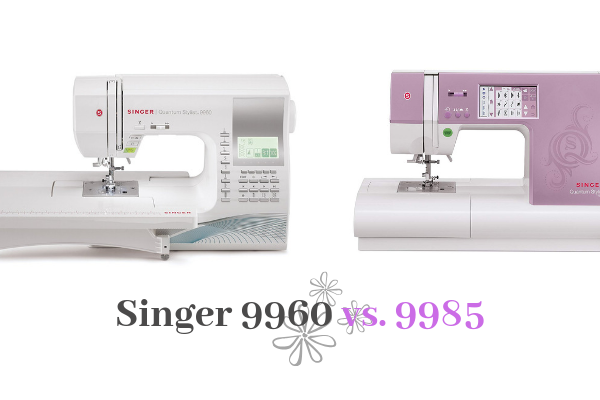 Singer 9960 vs. Singer 9985: Which Should You Choose? How do the Singer 9960 and 9985 differ from each other? And then you think, which one would really suit me? So, how do you choose between the two? Let’s look at both the machines in depth to determine which Singer model you should go for. 2.1 9960 vs. 9985 – Which Is The Better One? 3.1 Which Is The Best For Quilting? 3.2 Which Is Ideal For Alterations? 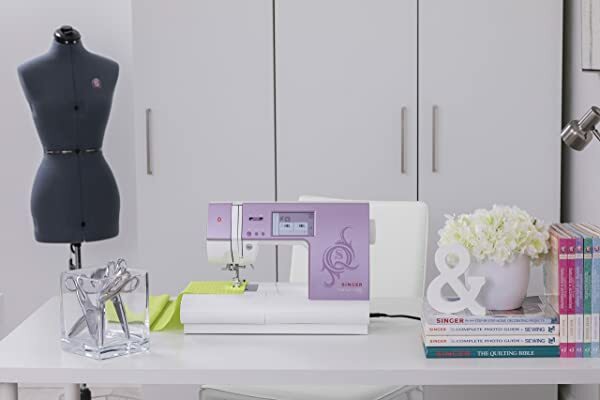 3.3 Which Is The Best One For Sewing Apparel? 3.4 Which One Is Suitable For Heavy Duty Sewing? 3.5 Which Is The Ideal One For Lightweight Fabric? 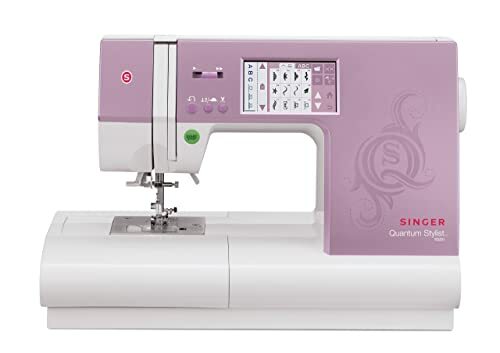 3.6 Which Is Most Suitable For Decorative Sewing? 3.7 Overall, Which One Is The Best For Beginners? Both the models are from Singer’s Quantum machines. Thus, both feature automatic and manual tension adjustment. Both models come with a wide stitch width that goes up to 7mm. In particular, this comes quite in handy for making lovely satin stitch decoration. 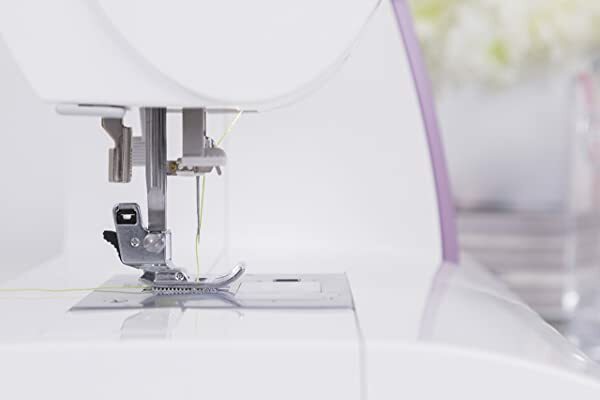 With a speed of up to 850 stitches per minutes, both machines are quite quick. However, while Singer claims the speed to be quite a lot, it is just average. Both the models come with the ability to change the speed using a simple sliding lever. In addition, you can just move the foot pedal, and the Singer Stylist models will see at the consistent speed. The similarities sure seem to go on and on, but now it is time to discuss the key differences. Even though both the models are part of the Quantum Stylist line of machines, they look quite different. While the 9960 has the LCD on the vertical part, the 9985 has the LCD on the horizontal part of the machine. The color is also quite different. 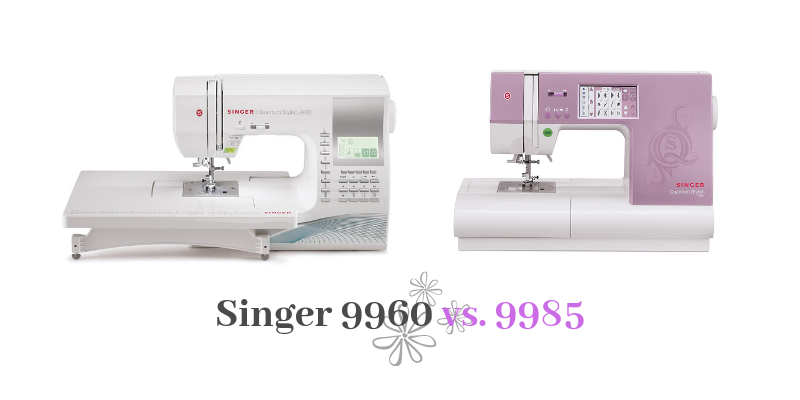 While the Singer 9960 is white, the 9985 is of a mauve or slightly pink in color. There are also major differences between the functionalities of the two. The 9985 comes with a better user interface display. There’s also an advisor that walks you through all the on-screen help. So, you can elongate the design and also put together some stitches to make a border. Having a larger screen along with additional help is surely beneficial. However, you should know that there are various online videos that teach you all this for free. So, you can also do well without extra help. 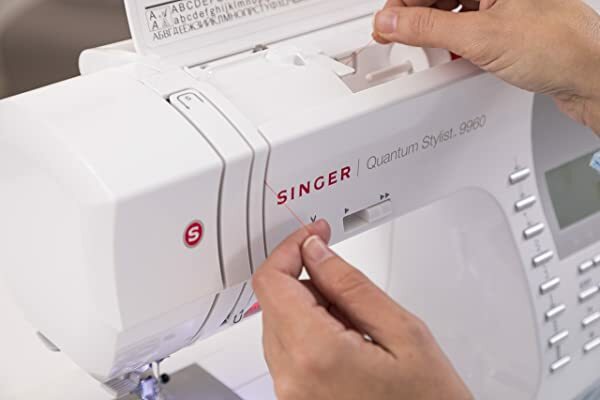 Not only does the Singer 9985 come with one more alphabet, but it also comes with more than 360 extra stitches. Most of these stitches are decorative ones. While the 9960 model comes with an extension table, the 9985 doesn’t. 9960 vs. 9985 – Which Is The Better One? When it comes to which is the best, it primarily depends on what you wish to sew. Generally, you should opt for the 9960 from the two unless you’re sure you’ll be using the extra alphabet and the decorative stitches. When it comes to additional help, the questions remains; is it really worth it to go for the 9985 keeping in mind the difference in price? The answer is a plain no. The problem is, the difference between the two is quite a lot, and with the 9960, you can get almost all the work done that you can do with the 9985. However, the color display of the touchscreen of the 9985 is much better compared to the plain white and black LCD of the 9960. Regardless, you can still manage with the Singer 9960 if you just adjust the LCD’s brightness. Now that you know the key differences and similarities let’s talk in terms of functionalities. Which Is The Best For Quilting? 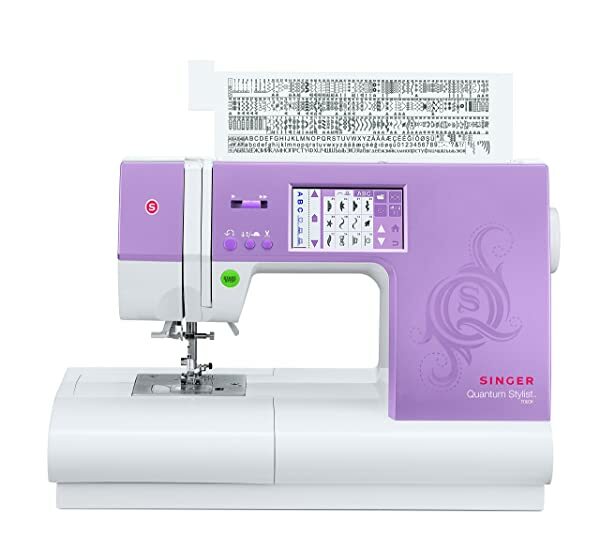 The most suitable option for quilting is the 9960 since it comes with an extension table. Quilters generally require the additional space while working on large quilts. Which Is Ideal For Alterations? For alterations, the 9960 is the better choice since it is also available at a good price point. For someone dealing with alterations, decorative stitches of the 9985 will hardly be of any use. Which Is The Best One For Sewing Apparel? Choosing the best one for apparels is surely slightly difficult. 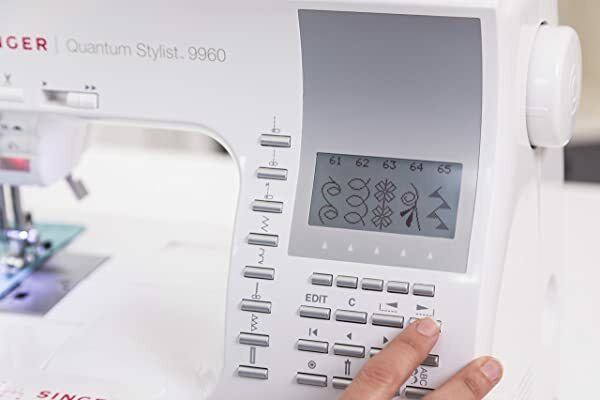 If you’ve just started with sewing or are interested in some decorative stitches, you should opt for the 9960. However, if you’re creative and love to explore additional stitches, then it is better to go for the 9985. Which One Is Suitable For Heavy Duty Sewing? Both the models have a solid metal core that allows skip-free stitching. With the right accessories, people have been able to sew heavy duty items. However, both the models are computerized. So, if you do try to sew a project that is too heavy, then you might throw the timing off. Consequently, you’ll have to make a trip to the repair shop. If you are just dealing with a small section of heavy duty items like multiple layers at the seam of hemming the jeans, then use the special needle. Along with that, use the special plastic tool to sew over the hump. It is also better to either sew very slowly or turn the flywheel manually to avoid damage. Regardless, the DC motors also supply consistent power while you sew. 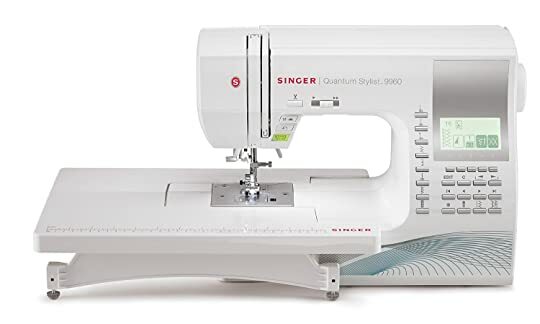 So, while both models can handle heavy duty sewing, none of the two would fit your needs if you only do heavy duty sewing. Which Is The Ideal One For Lightweight Fabric? Both the models are set to the automatic tension adjustment so that they can sense the fabric weight. However, you can adjust this manually when dealing with lightweight materials. So, there is no clear winner and both work equally. Which Is Most Suitable For Decorative Sewing? As mentioned earlier, the 9985 has more decorative stitches. So, determining this depends on you and whether you need more options for embellishing or not. The built-in guidance and the documentation help to make embellishments and decorative edging on your backpack and jeans. Overall, Which One Is The Best For Beginners? Considering the features and price, the 9960 seems to be the ideal one for beginners. 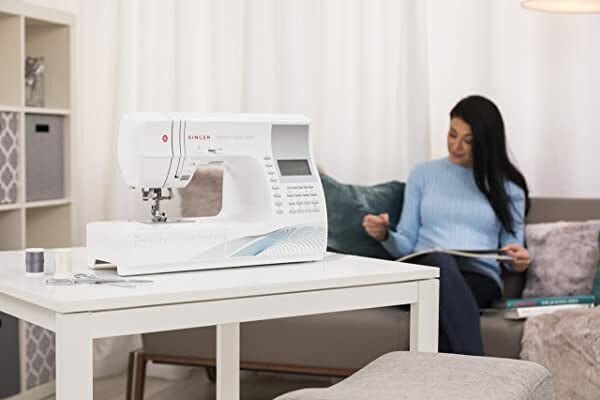 It is an excellent sewing machine that promises various decorative stitches as well. Again, overall, the best machine seems to be the 9960. It has a good blend of features at a great price. Moreover, the differences in both are quite minute. Plus, it is much easier to learn on the 9960 since there are fewer things to be distracted by.